Shalan and LeBraun set out to plan an intimate destination wedding in Maui, Hawaii and a hometown reception upon return to Nashville. The outdoor ceremony was held in the grass in the middle of an olive grove in Upcountry, Maui. The Villa at Calasa Olive Farm is an exceptional setting at an elevation of 2200 feet. It boasts incredible bi-coastal views of Maui, enveloping silvery olive trees and grapevines in the cool upcountry mist. It was such an honor to be photographed by KT Merry to celebrate the new addition to our family, baby boy Rev. We took her to our favorite beach and surf spot by our home on Maui's north shore, Ho'okipa. Michelle and Yu hosted a beautifully designed destination wedding at the four seasons Lana’i. pastel-hued roses filled the elegant outdoor scene. Featured on martha stewart weddings. if you are lucky enough to land on the island of maui, you must visit the andaz maui at wailea resort, known for incredible local design, food and hospitality. 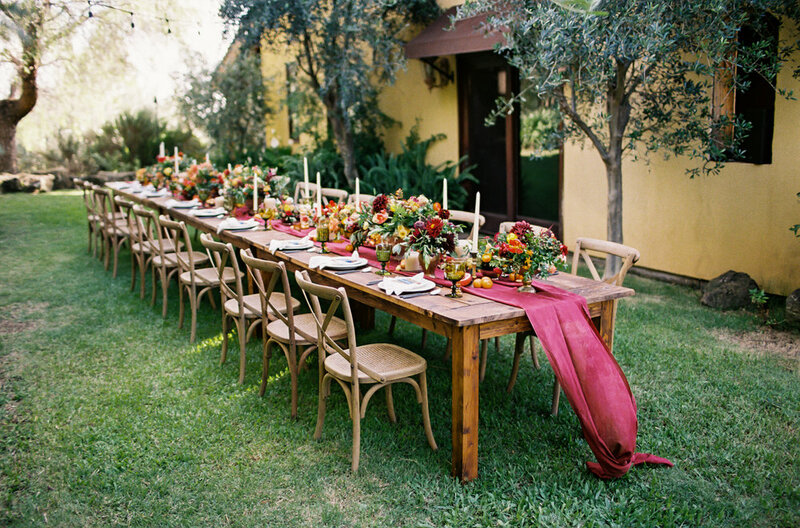 for melissa and sam’s rehearsal dinner, we hosted a bright and fun outdoor gathering! We recently had the honor of producing a modern tropical lu'au at the four seasons resort lana'i. Floral Designer Teresa Sena has mastered the craft of arranging local foliage with bright, tropical blooms in unexpected ways. We couldn't wait to share this fun mix of design elements with you! Bri & Webb hosted an intimate wedding weekend in the town of hana on the eastern tip of maui, hawaii. they wed on the ocean bluff set amid rolling grass fields and palm trees above hana bay at travaasa Hana resort. Located just minutes from the bohemian surfer outpost of paia, maui, this oceanfront private estate is a dream locale for intimate weddings. Natasha + Zach wanted to host an intimate wedding in a tropical paradise. They found their dream location on maui's west side at an oceanfront plantation house. Wanda + Julian hosted a Dreamy destination wedding at an oceanfront private estate in maui. Their day reflected this easy going couple perfectly. What a fantastic year 2017 has been—full of beautiful and amazing moments. thank you for being a part of it! before we jump full swing ahead into another year of gorgeous weddings, we'd like to reflect on our favorite wedding details of 2017. While we have our hands in almost every detail of the wedding planning process, we very rarely chime in on gift registries. We'd like to change that. Since it is the season of giving, the idea of contributing to a charity or a humanitarian effort or something greater than oneself is even more poignant for us. what better opportunity to give back to the world than with your wedding registry. Anna + Tyler hosted a gorgeous destination wedding at calasa olive farm in upcountry maui. The intimate fete was inspired by the autumnal season, the bride's Sicilian Heritage, and the natural beauty of hawaii. On a recent trip to hawaii from their home of colorado, bri + Webb adventured to hana with their wedding photography team at maui maka to capture an engagement session set against the beauty of the countryside and famous red sand beach. "hana has been my favorite place for as long as I can remember," bri says. Although we come from the land of eternal summer here in hawaii, we still love to celebrate the season with bright, cheerful blooms and pops of fun, unexpected color. we designed a tabletop for a gorgeous oceanfront venue on maui's north shore with floral designer mandy grace. For Clara and Elbert's destination wedding in hawaii, they wanted to host their out-of-town guests with a welcome dinner on the lawn at the four seasons resort lanai at manele bay. we imagined a bright, tropical scene where local food, fruity cocktails and relaxation took center stage. we all know that weather can wreak havoc on our hair and makeup; from smudged foundation to turning wavy locks into full-on frizz. that's why when it comes to a destination wedding, it's more important than ever to not only choose a look that suits the maui vibe, but one that can also withstand a day in the sun. destination weddings are woven from a complex fabric of families, emotions, circumstances and travel. in trying to juggle these elements, it's vital to keep a clear head, and equally important, keep the process enjoyable for both you and your guests. the best way of achieving this is by simply being thoughtful and learning what is and isn't expected. this romantic vineyard style location was perfect for their intimate wedding celebration, of 46 guests, to watch the couple walk down the aisle in a clearing amongst rows of love trees! The celebration continued with a cozy food focused reception, with a family-style italian meal, craft cocktails, and oven fired pizzas! hawaii is the mecca of voluminous blooms, lush greenery, horticultural illustrations and an abundance of stunningly natural details. specifically, the island of maui. close your eyes and picture a wedding on maui. white sand beaches, tall palm trees, fresh flower leis, vibrant colors; the uncompromised beauty of botanical details is ever-present in this exquisite one of a kind location. one of the most special moments of the day had to be the hula dances performed by olivia, her mother, cousins, and niece in honor of her late father - surprising michael for a tear jerking reception! This beautifully heartwarming couple and family were a joy to work with and we at Belle Destination events are so thrilled to have olivia and michael's ocean front celebration featured on 100 layer cake, spreading their beautiful hawaiian love story for all to be inspired by! with from its striking natural backdrops to its ideal climate and elegant venues, hawaii has been a widespread wedding destination for decades. the options are truly endless, ranging from the modern luxury of the big city of oahu to the cloud-shrouded mountains of maui. regardless of which breathtaking locale you choose to tie the knot in, you'll need a detailed checklist to help make the process of planning your destination wedding that much smoother. belle's destination wedding checklist will see you through every step of wedding planning from the day you get engaged to hoping on the plane to say "i do." Picturesque landscapes with exotic trees towering over your ceremony space. waves in foamy perfection crashing down in the background. the magnificence of mountains standing tall with flowing streams of tropical bliss. Blooming flowers sparkling in the sunny glow of their natural habitat. this is the kind of stuff wedding dreams are made of! however, when it comes to a destination wedding, beach wedding hairstyles can be a bit tricky. heat, wind and humidity can alter your hairdo and leave you displeased with your look and pictures - and you didn't come all the way to look anything less than amazing! Reflecting back on kari and fede's wedding at the sugarman estate, where bold and bright colors set the tone for their fun filled day. It was important to both the bride and groom to have lots of bright color was a perfect palette for the ocean front estate! We love it when our clients step out of the box and want something a little different. They incorporated some personal touches through bright teal embroidered runners from anthropology, which was a start to building the bold color scheme. As if weddings themselves weren't enough to rejoice, eloping in maui is like winning the venue lottery! from the miles of beaches filled with soft sand and grassy knolls overlooking the pacific to the breathtaking crystal blue morning water and bright, lively sunsets, eloping in maui can be the most romantic moment of your lives! while the relaxed and romantic atmosphere provides you with plenty of natural scenery and décor, there are many ways you can accentuate your location and make it your own. Let's welcome in the new year with a salute to green. The global authority on color, pantone, has released their 2017 color of the year, a refreshing and stimulating shade called, greenery. the company describes it as "a fresh and zesty yellow-green shade that evokes the first days of spring when nature's greens revive, restore and renew." With floral inspiration all around us, it can definitely be a challenge narrowing down floral design when it comes to your wedding day. With the onslaught of social media and pinterest and the ubiquitous accessibility of content available to us, there really is seemingly endless possibility. So, while we may not be florists ourselves, we've seen it all from Monochromatic florals to fun and festive tropical floral design, and are here to walk you through the design process - starting with all things floral! Randi and Dylan's wedding is a favorite of ours to look back on, from the beautiful, rich berry tone flowers by mandy grace designs, to the décor, to the amazing images captured by the one and only tamiz photography. randi's bridal style was a focal point for this bohemian-inspired hawaiian wedding day. her long sleeve, open-back wedding dress from one day bridal just looked stunning on her. Laura And Marco’s Stunning Wedding Day Was Nothing Short Of Spectacular. Located At A Private Estate On Maui’s South Shore, The Venue Provided The Perfect Backdrop To Their Intimate Ceremony And Love-Filled Reception. Surrounded By Their Closest Friends And Family, Laura And Marco Basked In The Incredible Emotion Of This Amazing Moment And The Joy Was Captured So Perfectly In Their Gorgeous Smiles. It Takes Just One Look At These Amazing Photos To See How Truly Happy They Are Together. When it comes to your wedding day, it’s all about your vision as a couple and the merging of two to become one. But, when it comes to your bridal style, it really is all about you! Island bridal style is a great opportunity to make a statement for your groom, and your guests. From bohemian-inspired dresses to couture gowns to everything in between, your bridal style should epitomize your taste and personality. Caroline and Phil’s wedding day is such a highlight in our event planning experience—for so many reasons! It’s always incredible designing a wedding based around a couple’s unique needs, but Phil and Caroline exceeded all our expectations when it comes to a couple in love. Their appreciation for tradition really resonated with us, and the St. Benedicts “The Painted Church” served the perfect venue for their love-filled ceremony. The colorful church was such a vibrant focal point to set the tone for their overall aesthetic. Ashley and Paul’s wedding centered on timeless Hawaiian tradition, blended with modern elegance. As with any wedding, creating a design aesthetic is one of our favorite parts of the planning process. And when you’re saying “I Do” under tropical palms next to the rolling waves, a simplistic white linen ceremony arch did just the trick! From the beachside ceremony to the rustic seating vignettes, their big day was perfectly tailored to them as a couple. When it comes to your wedding day, it’s all about bringing your unique vision to life. Whether you gravitate towards a bold, colorful aesthetic, or a relaxed, rustic design, you can be sure that the Hawaiian coast is the perfect canvas ready to be transformed. Deirdre and Darryl’s romantic Hawaiian nuptials were nothing short of spectacular—and definitely a personal favorite in our book! Wedding Planning Blogs from Belle Destination - Stay up to date on the latest tips, tricks and trends within the wedding and events industry.